I went to LBC in Araneta Square Monumento last Sunday morning. There was a long line of customers so I did some other errands first. When I got back, the line was still long and was not moving. Several people arrived after I did and the line got longer. There was only one LBC staff attending to the customers and for some weird reason, she was taking a long long time doing whatever she was doing. It took around 25 minutes for her to be finished with two customers. The girl in front of me ran out of patience and walked out. The guy behind me was muttering angrily to himself. I could consider myself lucky that none of the people in front of me was there to send packages since packages take longer to be processed (they have to be examined, packed, labeled). I had no idea why the LBC girl took ages to process remittances. After around 25 minutes since my arrival, a male LBC staff arrived and things finally got moving quickly. I reached the counter five minutes after that guy came in. I've been to a dozen LBC branches around Metro Manila for at least 50 times and last Sunday was the second worst/slowest service I got from an LBC branch. The worst one was in the Metro Point Mall branch, where customers were on the verge of rioting. I emerged from that branch a bit homicidal, 40 minutes after I entered. A lone female LBC staff was on duty that time too. I wonder if it's the same girl. The slowness was really annoying. The thing is, the slowness was not due to there being a lot of customers and only one staff -- the customers got to pile up because of the slowness and inefficiency of the employee. See the difference? I had been to busier branches manned by a single staff but the service had been okay, even if half of the customers who were there with me brought things to be packed and shipped off. Another source of annoyance I got dished by LBC recently involve their online tracker. I have ranted against the LBC tracking system before, but those problems were caused by technical errors. Now, I have human errors. I've posted screen captures of the tracking info, blacking out the names of the packages' recipients to preserve their privacy. The four packages were shipped either last month or this month. All of them were to be picked up by the addressees so on the LBC waybills, I wrote the specific branches and noted that the packages were for pick-up. I did not put any other address to prevent any confusion. Very simple. Problem: The package was included with those to be delivered. When the recipient went to the LBC branch to get the package, it wasn't there. She had to come back the next day just to get it. What a hassle! Problem: Again, the package was put in the delivery truck. Then delivery failed because "the house was closed". Funny, last time I checked, SM Consolacion is not a house. House closed huh? What house? Damn liars! Next day, the package was out on delivery again! Like in Package 1, the recipient had to return the next day just to get the package. Problem: First the package was out for delivery, then the status changed to "picked up by Nelly Abapo". The recipient is not named Nelly Abapo but I thought she just sent a representative to get her package from LBC. But, nope! 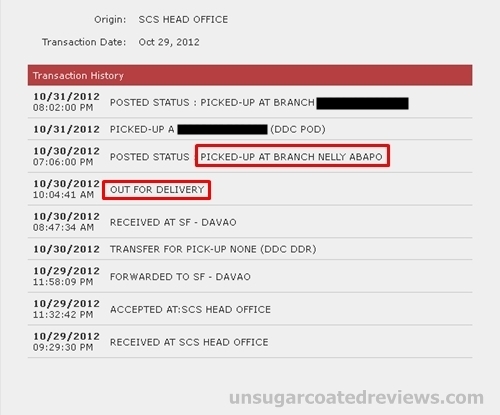 She did not know anyone named Nelly Abapo and the package was not in LBC Bajada when she went last Oct 30. Thank goodness the package was there when she went back the following day. Who the hell is Nelly Abapo anyway? 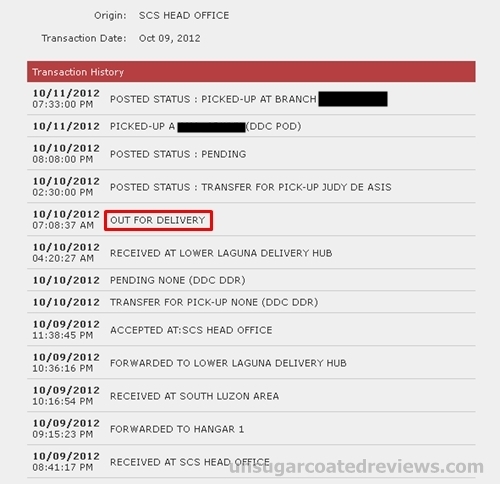 Problem: The recipient texted me yesterday (Nov 12) morning, saying that the package was not in LBC Bulan. The status stated in the online tracker at that time was "Pending". 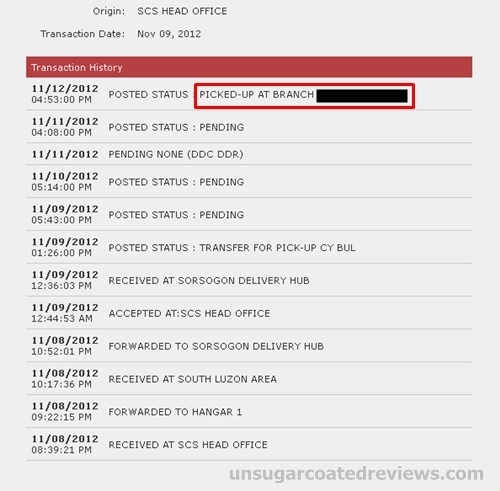 I rechecked the tracker at around 5:30 and saw that the status was updated: "picked up at branch <insert recipient's name>" so I thought everything was already okay, that the recipient went back to LBC that afternoon and got the package. When I texted her that night to confirm, though, she replied that they haven't gone back to LBC to claim the package. I've done several transactions with this particular client and have no reason to doubt her words. WTF, LBC? What's up with the lies? non delivery of package (important documents needed by employer abroad) has long been out for delivery, supposed to be last week 7th of July, it's 14th now.. emailed the costumer service and notified me that they have already coordinated with the team, but still waiting game is on! until forever? 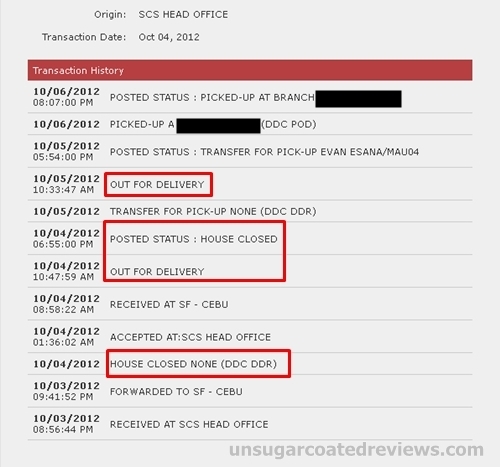 LBC tracking page shows attempts of delivery (twice huh? )with "House Closed" indication, funny! typhoon had been racking our locality the whole week so we had to stay home and it makes sense doors should likewise be closed!maybe LBC agents responsible for failure deliveries LEARN how to knock doors?still waiting..hope all my patience won't run out until end of this day.